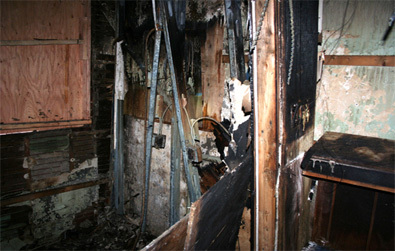 HEATING APPLIANCES CAN CAUSE FIRES AND EXPLOSIONS THAT RESULT IN DAMAGE WAY BEYOND A CORNER OF THE BASEMENT. 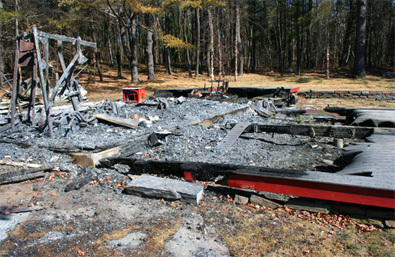 A boiler explosion led to this fire that completely destroyed this residence. Causes for boiler fires and explosions can include homeowner neglect, improper maintenance from the service company, old and deteriorating parts, burner malfunctions, and so on. Malfunctioning hot water heaters can also be the cause of damaging fires for many of the same reasons listed above. 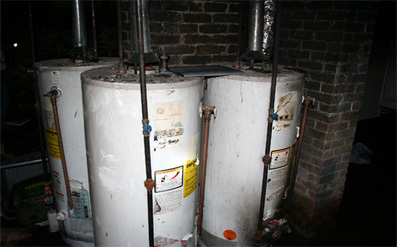 ISE maintains a temperature controlled evidence storage area in which damaged hot water heaters and other appliances may be held pending further examination or court proceedings. Fires from heating appliances may start in the basement but can quckly spread throughout the house causing widespread damage. ISE has the tools, talent, and laboratory facilities to bring each investigation to a successful conclusion.